It feels like every month over the last year, we’re seeing a new platform launching in mobile. From App Streaming, Android Instant Apps, Facebook Instant Articles, and Google Accelerated Mobile Pages (AMP), we’re a bit overwhelmed and frankly quite jaded. Having had the privilege to work with many of the best in mobile, we at Branch measure the stickiness factor of these platforms by how often our partners request us to work with one. Unsurprisingly, none of the above have prompted much activity. The one that stands above the rest is AMP. We’ve recently been receiving a lot of requests to help companies deep link out of their AMP pages. After reviewing the technology in detail, and observing recent reactions from the community, we were shocked at the self serving and strategic nature of this move. Google is quietly creating a privatized, walled kingdom within the open web that their company was built on. AMP will have tremendous implications on the future of internet businesses, and should be a point of concern for every company working on crafting their mobile product strategy. When Google first launched in 1998, AltaVista was already four years old and the industry considered search a commoditized technology. The largest internet website businesses at the time (Yahoo, Excite, AltaVista, etc) were individual players building brands amidst an influx of new internet sites. No single company owned the internet stack. Websites were publicly crawlable and digestible to any new upstart looking to build a new search engine. Even if AltaVista saw Google as a threat in the early days, AltaVista had no control of the internet platform and therefore could do very little to stop that upstart. An open platform is a blessing for startups and a curse for incumbents. Fast forward to today and mobile is the new battlefield. Native app adoption is accelerating, and the web is being used less and less each year. The powerful standards body that fought to ensure that the web remained free and open over the last 10 years can no longer influence anything other than the single browser app on a homescreen filled with other colorful and alluring app icons. These other native apps are being built on the privately owned and maintained operating systems of Android and iOS, with very little oversight than a review process that has accelerated and diminished over time. This affords the top apps like Facebook, Snapchat, WeChat free reign to set up privately-controlled kingdoms without the oversight of a clear standards body and then wage a war for users time. Facebook is the epitome of a well-designed walled kingdom, as they’ve taken great strides to fence off their territory. The objective is to offer everything a user needs without them ever leaving the Facebook platform. For example, Facebook touts a private standard called Instant Articles for publishers to host articles on Facebook, offering faster load times when the article is clicked from the Facebook feed. They recently announced the same concept for games as well. Facebook has even gone so far as to prevent links to other apps like Yelp from leaving the Facebook app. This latest change to keep users in the Facebook ecosystem even comes at the expense of the user experience, as they are blocking links to the Yelp app even when they know the app is installed. All of these tactics strengthen the walls of their kingdom, ensuring that once a user enters, they can never leave. On the other hand, Google’s mobile search business inherently can’t create these same types of barriers due to the openness of the web that allowed it to thrive initially. When a user goes to search for something, the intention is to leave those search results to immerse themselves into a different site not owned by Google. Looking for a specific product? Search and then browse Amazon’s site or mobile app. Want to find a specific news article? Search and then navigate to the appropriate news publisher’s site or into their app. Then, these isolated businesses can apply their years of collective product and marketing knowledge to ensure that users never need to go back to Google to search again. This lack of defensibility is a huge weakness for Google, as the majority of their mobile revenues are based on a decreasingly relevant browser icon on phones that leaks users to other businesses. Their mobile business is vulnerable to companies that are nimble enough to innovate and establish a stronger kingdom than their own, offering an alternative search experience with much stronger defensibility through data or technology. 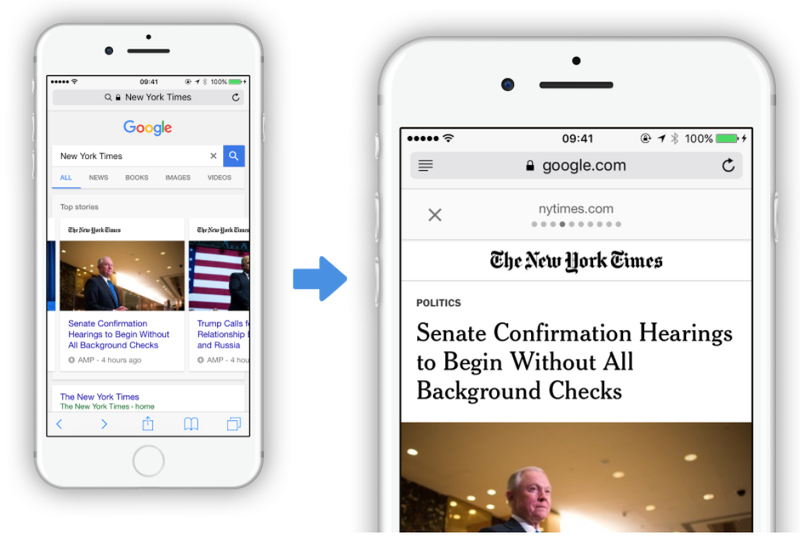 Enter the Accelerated Mobile Pages project, or AMP. It’s a new framework for building websites that heavily restricts the capabilities of modern day web programming, in favor of speed and responsiveness. On the surface, the AMP standard itself is quite harmless and will encourage people to build more higher-performance sites, resulting in faster mobile web load times. The problem is actually how Google search has started giving preferential treatment to AMP sites. When publishers opt in and mark up their site appropriately, Google will actually begin hosting the AMP site on their own servers. This changes the URL from “yoursite.com” to “google.com/amp/s/yoursite.com”. Only those sites hosted by Google are given preferential search positioning placement. 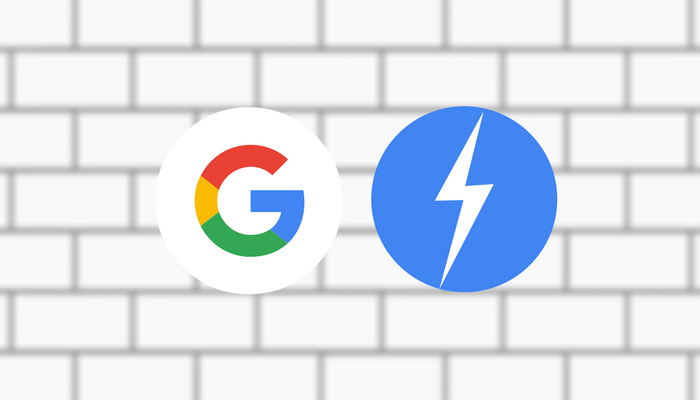 By hosting the AMP page on their own servers, Google achieves many goals around tracking and analytics, letting them observe the engagement of users with sites that they previously had no visibility into. However, most visibly and possibly most offensively, Google can now manipulate the layout of these hosted sites. They’ve started by injecting a back button that returns the user to the initial search result. This might look familiar to those of you who have seen the same back button inside Facebook’s in-app browser, pushing users to return to their newsfeed. If that isn’t a strong armed first step to establish a sturdy wall around their search engine, then I don’t know what is. In the future world where AMP is adopted universally, Google will have unprecedented control over a site, allowing them to modify the content or shut it off at their will. They can manipulate the user experience, funneling users back to Google as they please. As the site owner, you might not even realize something was changed about your site until your users start complaining or the metrics drop. This is a move unlike any we have seen before, and represents a complete pivot from the open web that gave birth to Google. However, given the trends of all major mobile internet companies to build these walled kingdoms, we shouldn’t be surprised. Unfortunately, there’s not too much that can be done to stop Google or other companies for fighting for control of their users. You, as the business owner who depends on mobile traffic to survive, must build a walled kingdom of your own, while conforming to the new standards built by the big platforms. That means that you’ll still need to build an AMP site or potentially lose the premium search slots to competitors, but the sole objective of that AMP page should be siphon the traffic out of Google’s kingdom and into your own. It should be viewed tactically as a landing page. Every link on this page should be directing users out of the AMP site and onto your full mobile website or native app. The strategy is to employ whatever tactics necessary to build a direct relationship with your customer, and keep them coming back. Push users to register with an email address or commit to notifications. Get them to download your app and agree to push notifications. These are the same types of tactics that the big platforms are employing to build the kingdoms of their own. From Branch’s perspective, we continue to notice that the best kingdoms are built within the native app experience on iOS or Android. Of all the privately owned platforms prevalent in mobile, they are by far the most stable and give you the most control of your brand while building powerful experiences to delight and entertain your users. Ultimately, as long as you’re cognizant that the platforms are working to keep users from leaving and becoming yours, you’ll design your product and marketing strategy to help defend against these tactics.